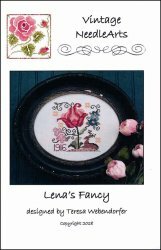 Lena's Fancy [G1106] - $10.00 : Yarn Tree, Your wholesale source for cross stitch supplies. A cross stitch pattern from Vintage NeedleArts. Look at this beautiful, delicate, design. A large, beautiful, pink flower blooms, while a deer sits on the hillside. Small blue & pink flowers bloom next to the large flower. What a precious design to stitch & frame for a grandma or even a grandchild. Be always blooming! Stitch count is 76W x 80H.